Last night I tried a little experiment with f68r2. It always puzzled me that some stars in this "sky" are labeled and others not. If we take the upper roundel to represent East (moonrise) and the lower one to be West (sunset), "Orion" is correctly oriented in the sky. 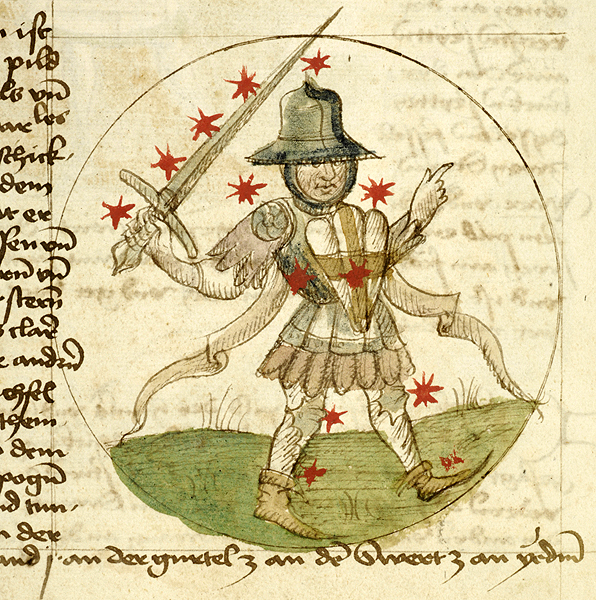 Although I must say, medieval representations of Orion are not exactly shining examples of accuracy either. BL Harley Ms 647, 9-11th C France, f8. While I'm not sure you have the answer, I commend your thinking. The fact that some stars are unlabeled in f68r2 is something worth thinking about explanations. And not only that, but it also features the "belt" of (unlabeled) stars on the circumference (which f68r1 does not). Given that 68r1 and 68r2, judging by their similar framework, very likely present two "complementary" entities (day/night, east/west, north/south, summer/winter etc. ), what would it mean that some stars are unlabeled in 68r2? One explanation is that the set of 68r2 is in a certain way "less explored", "less known" or "less developed" - such that it is known that there are objects in this set, but not all of those objects are known. In this perspective, the belt of stars may be just an embellishment introduced to stress this point. Another interesting speculation is that the total number of labeled plus unlabeled stars, belt excluded (as just the embellishment), would be essential (otherwise, why would unlabaled stars be needed elsewhere outside of the belt itself). I once tried to match the exact numbers of objects in 68r1 and 68r2 to something known in the history of science and art, but to no avail. 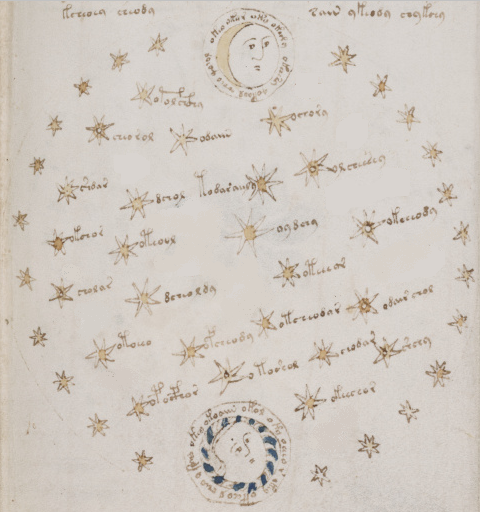 Quote: Different stars vary in size and in paint: some are left unpainted, some are ochre-painted (as all dayside stars are); some have a little circle in the centre which can be either ochre-painted or outlined and unpainted. Two of the dayside stars have a black circle in the centre - but that can be attributed to blots in unpainted outlined circles. 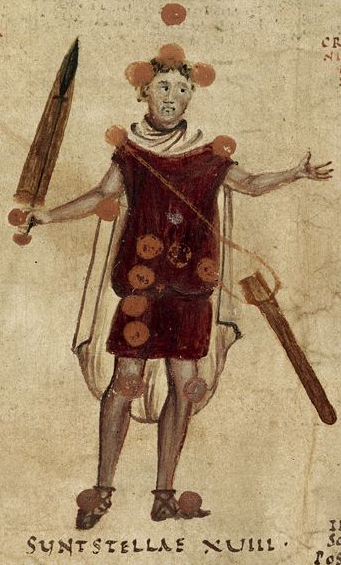 Looking at unlabeled stars in f68r2 (belt excluded), they are not all the same in this respect - one star out of those has that little circle (featuring both ochre and outline) in the centre. Which is quite strange. Looking at the belt, all stars thereof are basically the same - ochre in the centre. A couple of stars are unpainted, but that may be due to fading. It's probably coincidental, but if you look at the image of Pleiades that I linked in the previous post about Solomon's Key, it happens to be the brightest star in the illustration and corresponds to the star with the circle in the middle in the VMS drawing. 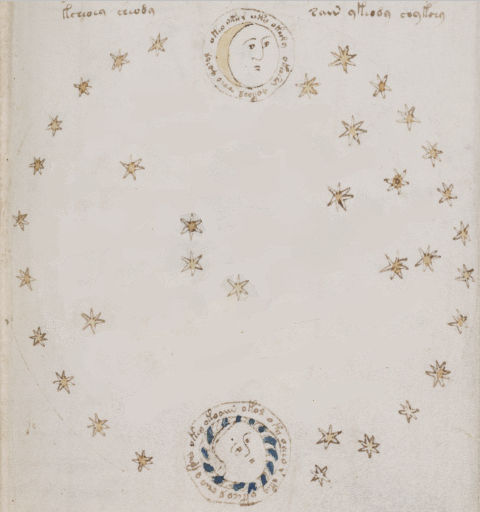 The trouble with star maps is that you can never get to the constellation without text. I mean, look at this one. 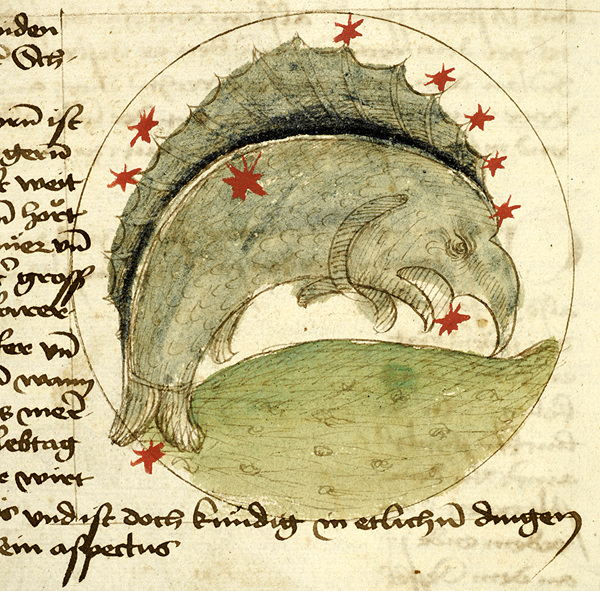 How did the illustrator get from the stars to the map? !